Challenger CL4P9X Ex-Length 4 Post Storage/Service Lift 9,000 ALI Cert. Challenger’s CL4P7 7,000 lb. capacity and CL4P9 9,000 lb. 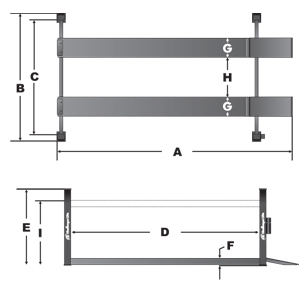 capacity 4-post lift was designed with versatility in mind. 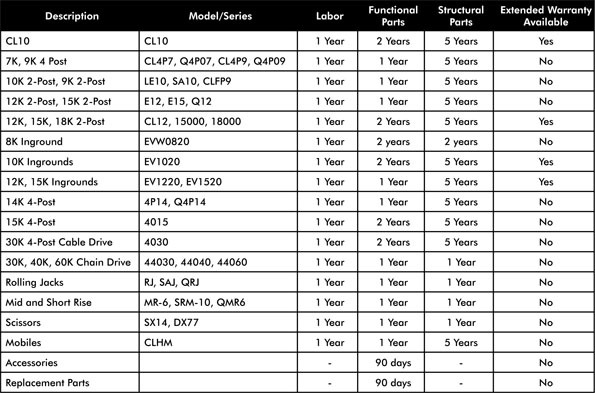 From home enthusiast and commercial storage applications to light duty general service applications, these lifts compliment your service needs and are loaded with real benefits. They are essential for the “do it yourself” home garage, providing the best of both worlds - store a vehicle up top and below with up to 80” of clearance when the lift is fully raised, or use this lift to service your vehicles. Challenger Lifts’ 9,000 lbs. capacity CL4P9S, CL4P9X and CL4P9W 4-post home car lifts are perfect for light duty commercial service or storage applications. Challenger Lifts 9,000 lbs. 4 post lift and commercial service lift units give you unlimited options for your shop's layout. 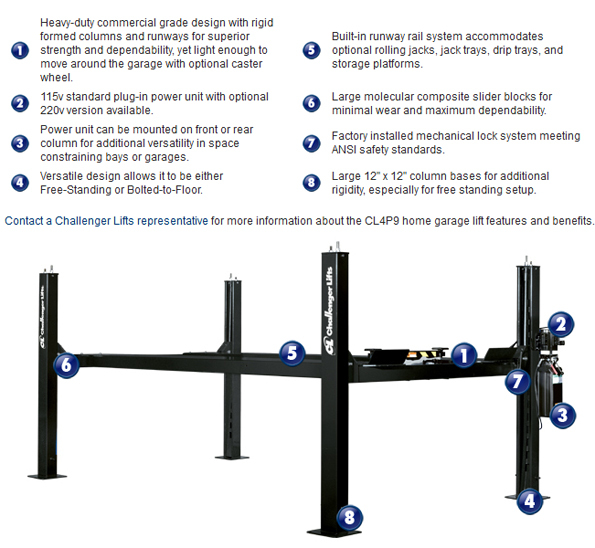 Another great feature of the CL4P9 series free standing 4 post lift is its portability. You can choose between bolting it down and leaving it free-standing so you can relocate it anywhere. If convenience is important to you, the free standing 4 post lift is a great option. Professional grade quality with 80” high rise and multiple lock positions is perfect for light duty service up to 9,000 lb. capacity. 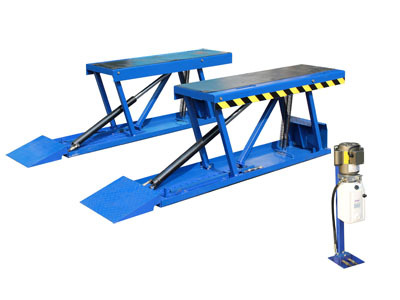 Optional rolling jacks and jack trays provide quick tire and brake work access. Service your vehicles or store them up top. With 80” rise height, most full size vehicles are easily parked underneath for everyday use. Optional drip tray set completes the storage application, keeping any fluids from contacting the vehicle underneath. The power unit can be placed either on the front column of the drivers side or the back column of the passenger side of the lift. This provides convenient power control accessibility and versatility for any garage layout. *1 Must be specified at time of order. Available in Black only. Dannmar D-12 Four Post Car Lift 12,000 lb.